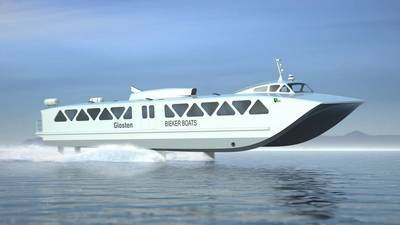 The provider of naval architecture and marine engineering services Glosten and marine craft builder Bieker Boats have joined forces to bring modern composite hydrofoil technology to the passenger vessel community. This collaboration draws on Bieker Boats’ years of experience designing fast foil-born boats and Glosten’s design of passenger vessels for public and private clients over the past 50 years, said a press note from Glosten. "This ultra-efficient vessel requires less than half the installed power of a typical passenger catamaran, resulting in a 50% reduction in fuel consumption. When compared to the latest foil-assisted low-wake small passenger vessels, the design achieves three times the passenger miles per gallon," it said. The design team achieved this by combining the proven technologies of ultra-efficient hydrofoils, lightweight carbon fiber hull construction, and modern geared propulsion equipment.